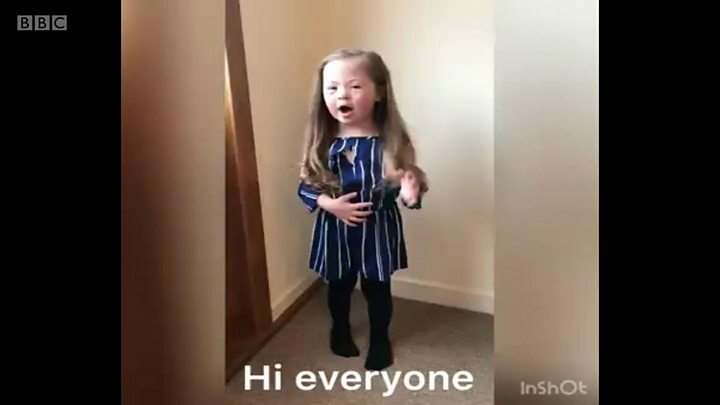 The girl who won hearts with her "wear odd socks for Down's syndrome" video has landed her first film role. Five year-old Chloe Lennon's video clocked up millions of hits back in March when she set out to raise awareness for the condition. Since then she has started working with a model agency and has been proving there is nothing she cannot do. After shooting campaigns for two high-street fashion stores, she has just been signed up for a film. Chloe, from Irvine in North Ayrshire, is preparing to perform in a Scottish short film this month. The casting call did not specify any disability and Chloe beat all the other candidates to the role. Her mum Jade told the BBC: "Last Monday I got an email saying her agent took a chance with it. They were specifically looking for a little Scottish girl. No mention of disability or a disabled model or Down's syndrome. "I had to send a video of her reading a bit of the script." Just two days later, Jade was told Chloe was booked for the job. She said: "The agency were so chuffed at another breakthrough for disability - because they hadn't asked for a disabled actor. "So of all the Scottish five-year-olds, they picked Chloe, not on tokenism but on credit. They liked the way she acted." "It'll be another new experience for her - filming over two or three days. She calls it her 'pretending'. "I can't wait for everyone to find out all about it when we are able to reveal the details." After starting school in August, Chloe has been fitting modelling assignments into her spare time. 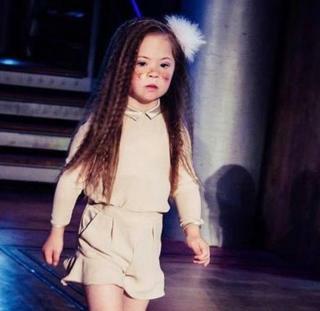 She walked the runway at London Fashion Week in the Mini-Mode children's fashion show. Her mum said she worked hard to be ready. "Five minutes a day after school we practised her walk," she said. "Chloe has low muscle tone because of her Down's syndrome and so we practised to make sure she was happy." And it was just as intense as any fashion show. "It was hectic, outfits flying around, children running about, hair and make-up going on," Jade said..
"But it was brilliant. Chloe loved it. She knows her model walk, she stands up straight and looks forward with her model face on. "After she came off she ran up to me and said she'd done so well." She added; "She knows what's going on, she did everything like she was supposed to, stopped, turned the same way. She knew she had achieved something. She was very proud of herself." Chloe will become a familiar face when her two fashion campaigns go live. And she is getting more confident by the day. She has spent the last six months taking part in photoshoots to give her experience, and according to Jade, she has transformed. She said: "Chloe has always been sociable but with being in this industry she has just blossomed and it is through getting used to meeting different people. "And it's helped her speech - I can't explain how much it has helped her. From doing little audition videos, it has helped her in so many other ways in her development." Chloe's agency - Zebedee models - thinks she has what it takes to be a massive success. Director Zoe Proctor said: "She has the most adorable personality. She is an open, sweet and very charming little girl. "In this industry you have got to have personality and take direction well and Chloe has everything going for her. That's why she keeps getting snapped up for things."